I feel like American audiences have been sold a false bill of goods with Night Creatures. The title implies quite a different movie than what we got. While today’s film was titled Night Creatures for the American market, its original title in the UK and elsewhere is Captain Clegg. That title isn’t exactly the best, either, as it makes the movie sound like something Disney would have cranked out for kids, and it’s not that. 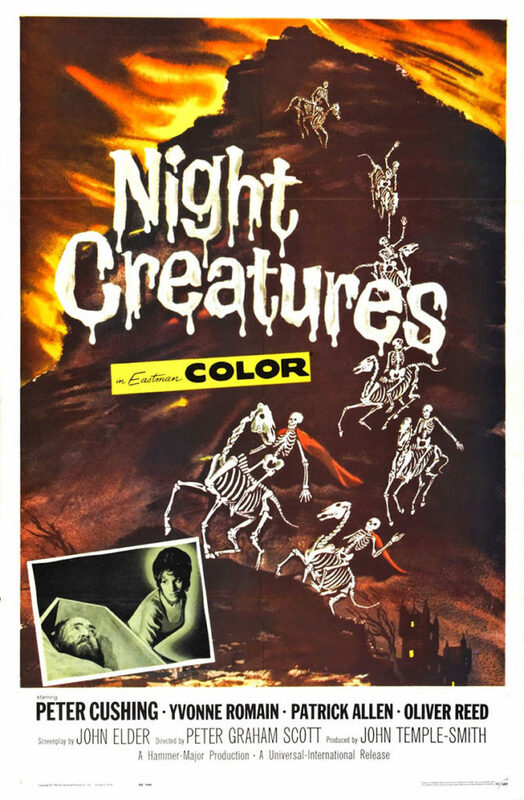 From 1962, Night Creatures, directed by Peter Graham Scott from a screenplay by Anthony Hinds, is a departure for Hammer. By the time this film was made, Hammer was fully invested in making gothic horror, but Night Creatures is a thriller. It can be painted as a horror flick, however, which is why I feel there’s been a little misdirection involved in promoting it. In 18th century England, a notorious pirate by the name of Captain Clegg was captured, hanged, and buried in a small coastal town. Ever since then, ghostly phantoms on horseback have plagued the marshes surrounding the town. Many in the town are terrified that such creatures lurk in the wilderness. Where did they come from? What is their purpose? Will anything be done about them? This film sets itself up as horror. But, it’s really about wily townspeople trying to hide their illegal activities from the government. The most influential person in the town is the local parson, Blyss (Peter Cushing). He holds authority over his flock from the pulpit and from his role as the head of a smuggling ring. Import duties and taxes have left the townsfolk in poverty, but a little ingenuity and the black market go a long way to alleviating this pressure. The Royal Navy gets wind of the activities of the town and dispatches a small force, led by Captain Collier (Patrick Allen) to put a stop to it. As for the marsh phantoms? They have as little real importance to the plot as Peter Cushing’s wig. Collier has no respect for the rights of the citizenry. He goes where he wishes on the authority of the king. It’s only scrambling action by the populace that keeps him from uncovering the smuggling as soon as he arrives. They use tunnels and coffins to hide their illicit wares. The coffin maker, Mr. Mipps (Michael Ripper) is a jewel of a character, and that’s down to Ripper. He has appeared in a number of the films that have been reviewed this month. He always plays a supporting character who usually has some eccentricity. What strikes me about Ripper isn’t the characters he plays but his skills as an actor. Taken on their own, his performances fade into the background. But having seen him frequently, sometimes day after day, while preparing for this month’s Horrorshow, I have been taking in his performances in a sort of mini-retrospective of his career. He took what, in many films, were throwaway characters and turned in reliable performances, over and over again. He was a skillful actor, probably relegated to supporting roles because he lacked the looks of a leading man. Michael Ripper has been just as pleasant a discovery for me this month as Terence Fisher or Jimmy Sangster. I never would have been aware of his existence if not for this month of reviews, and I’m glad that I am. Also, what a name for a character. Mr. Mipps. That’s my new favorite movie character name. I want to pluck him out of this film and put him in an ensemble comedy with Rupert Pupkin, Colonel Bat Guano (if that really is his name), and Judge Smails. Unlike many Hammer films, Night Creatures is fast-paced. There isn’t the long setup that typically takes up the first half of a Hammer film. From the start, the townsfolk are trying to outwit the sailors. That divides the film into little set pieces where Collier is chasing down a lead and the townsfolk manage to keep from being caught, a la Hogan’s Heroes, leading to a denouement for the town and its continued activities. People live, people die, and a rollicking film comes to an end. In just about every single way one could measure, this is a typical Hammer film of the era, only it’s not horror. It’s a period piece with the usual suspects in the cast (including a young Oliver Reed). It has the slightly cartoonish sets, costumes, and lighting of the horror films. And its pretensions never extend beyond being simple enjoyment.